I saw this idea at Norbury manor school for girls and it was simply a designers name written on a blank A3 sheet above each table. Table naming enables group work especially during question and answer sessions. You can set a group task and then ask the table name for a group answer. Table naming also encourages team work and I often find pupils involved in positive debates about who is the best designer. Each table is named after a designer or a famous figure related to your subject. I have developed the original idea and coloured all my table names with different colours. I also added information about the designer to the back of the sign and included the designer’s main web address. 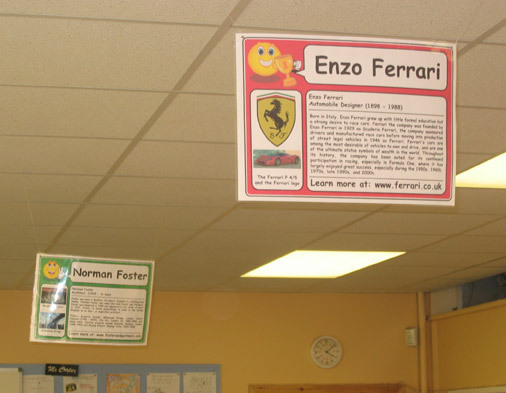 This created a small design museum within my classroom. I also created a homework task which made pupils research the table designer as a group and produce a presentation for the rest of the class. I laminated the two A3 sheets together then suspended the signs with clear nylon thread. Feel free to develop or modify the idea yourself. 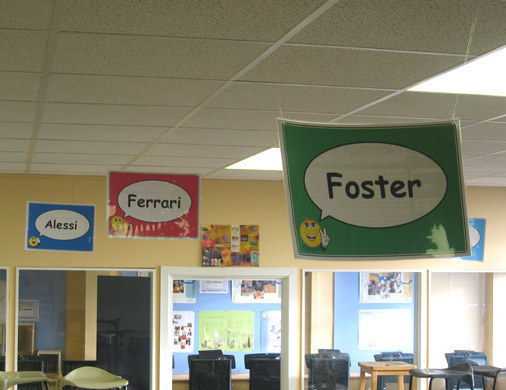 Create your own table names and choose your own designers to promote your subject. Pupils like to be involved in a team and the concept creates inclusion, fun and promotes learning in the classroom.